The Naked Communist is a 1958 book by American political theorist W. Cleon Skousen, a former FBI employee. The book has been reprinted several times, most recently in a 2014 printing through Izzard Ink Publishing, and it has sold more than 1 million copies. The book states that the Marxist–Leninist Soviet Union is attempting to implement a geopolitical strategy to overcome and control all of the world's governments that are not members of the Communist bloc. Max Blumenthal heavily criticized the book in his 2009 book Republican Gomorrah, where he dismissed it as a "right-peddling conspiracy tract." In contrast, the book has been highly praised by American conservatives Glenn Beck and Ben Carson, the latter of whom stated, "The Naked Communist lays out the whole progressive plan. It is unbelievable how fast it has been achieved." ^ Umbr(a): The Object. The Center for the Study of Psychoanalysis and Culture. 2014. Retrieved June 12, 2015. ^ Vegső, Roland (2012). 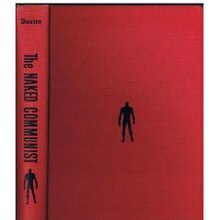 The Naked Communist: Cold War Modernism and the Politics of Popular Culture. Oxford University Press. ISBN 9780823245581. Retrieved June 12, 2015. ^ Haddock, Sharon. "Beck's backing bumps Skousen book to top". Deseret News. Retrieved June 12, 2015. ^ Forest Glen Durland (March 24, 2003). "Communist Goals (1963)". Retrieved December 13, 2014. ^ Blumenthal, Max (2009). Republican Gomorrah: Inside the Movement That Shattered the Party. Nation Books. p. 331. ISBN 1568583982. Retrieved June 12, 2015. ^ Wilentz, Sean (October 18, 2010). "Confounding Fathers". The New Yorker. 86 (32): 32. Retrieved June 12, 2015. ^ "The Kelly File with Ben Carson". The Kelly File with Ben Carson. YouTube. ^ "Urban Faith The Naked Communist". Urban Faith The Naked Communist. Urban Faith. ^ Mattingly, Phil. "Ben Carson's Longshot Presidential Bid Suddenly Looks a Lot More Realistic". Bloomberg. Retrieved June 12, 2015.